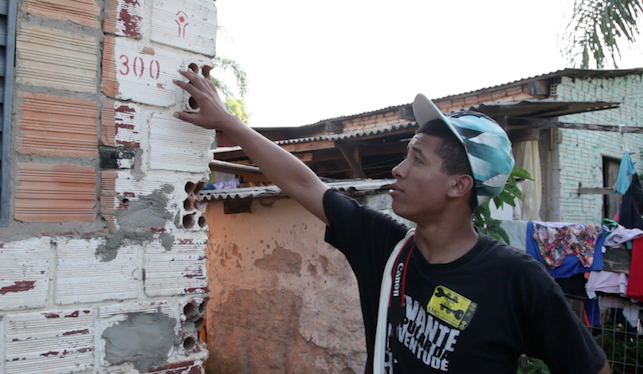 Carlos Alves–a 19-year old Cristal resident, community leader, and training participant–walked through the neighborhood beside me and pointed out the spray painted markings that the government uses to indicate which houses and families are slated for removal. He explained that the government made no attempt to remove the rubble from demolished homes, creating an abandoned space that attracts drug addicts, compromises the security of the families and puts psychological pressure on the residents to leave their homes. This most recent training contributes to the broader objective of equipping activist networks with video advocacy skills in order to fight megaevent-related forced evictions in the 12 cities hosting events for the World Cup 2014 and Olympics 2016. Read more and watch a video about the training and the Cristal community here.